The only thing that is truly ours is time, explains @TheTommyAngelo. Nothing is more valuable. Living in the moment: How the poker life helped free @TheTommyAngelo from hours and days and weeks. Playing poker for a living has leveled my perception of time. A once bumpy road is now paved, making for a smoother ride. Here's a nifty word: cathemeral. It completes a trio of biological terms. Animals active at night are nocturnal. Daytime animals are diurnal. Animals that do not have a 24-hour cycle are called cathemeral. A cathemeral animal eats and sleeps on no set schedule. That's me. My buddy Alex is cathemeral, too. We had to redefine yesterday, today, and tomorrow to keep from getting mixed up. Instead of using the arbitrary selection of midnight as the end of today and the start of tomorrow, we use sleep sessions. In my time frame, yesterday is the time period between my two most recent sleeps, today is the interval between now and the next time I go to bed, and tomorrow is the next time I wake up. Alex and I speak in the other's time frame. Let's say it's 6:00 a.m. Tuesday morning and Alex is leaving the casino and headed for bed when I walk in to play. If I say, "Let's golf tomorrow," this does not mean on Wednesday. It means, "Let's golf after you wake up," which would still be Tuesday. In this example, my today extends into his tomorrow. Einstein would approve of the way Alex and I travel through time, with both observers' reference frames equally valid. Weird, yes, but functional. We've never missed a tee time. This line from a song by The Who is often true: "Tommy doesn't know what day it is." And not just days. I lose track of which week it is within a month. And even months are a cause for pause sometimes. But not years. I'd never lost track of one of those — except for once. Back in grade school I was a gold-star arithmetician and prognosticator. Check this out. I'd take 2000 and subtract 1958 (my birth year) and come up with the right answer every time: 42, my age in the year 2000. The teachers were impressed, too. The only thing that is truly ours, the only thing that can never be taken back, the only thing we'll have until we die, the only thing that is ours at every moment, is time. Those numbers, 42 and 2000, were etched into my mind. So, when 2001 started, that meant I was 43. What it really meant was that I would turn 43 during the year 2001. But somehow, because of the etching, I sincerely and wrongly began stating my age as 43 at the start of 2001, eight months before I would actually turn 43. I had shifted my birthday from August to January without even realizing it. The awakening came in June 2001. I was buying tickets for an August concert. The date of the concert was the same as my birthday, and that got me thinking, wow, I'm 43, about to turn 44, and I've still got good gums. Not bad. But wait! I can't turn 44 in 2001 because 44 and 1958 are even numbers, meaning I wouldn't turn 44 until an even-numbered year, namely, 2002. Duh. By figuring out that I was still 42, I gained a year in an instant, just by being an airhead. It's like the thrill that a regimented person gets each fall when clocks are set back one hour. Free time from nowhere, except instead of one hour, I had picked up a whole year. It was like finding a wad of money that had been stashed away and forgotten. But when you think about it, it doesn't make sense that I got all happy about finding a misplaced year. After all, I'm going to live however long I live and that's that, right? Plus, numbered ages such as 42 and 43 are whimsically based on our planet's lap-time around the sun. Like that really matters? Our concocted units of time are useful because we agree on their meaning, but they have no effect on the actual time that passes. The notion that I had "gained a year" by miscalculating my age was an illusion. So why did it feel so good? The thrill came from the mere thought of having more time. When we think of what is "ours," money and possessions come to mind. But the only thing that is truly ours, the only thing that can never be taken back, the only thing we'll have until we die, the only thing that is ours at every moment, is time. Nothing is more valuable. And as my appreciation of time grows, so does my appreciation of time with people. "Living in the moment" is an ideal that has always appealed to me. Back when I was diurnal, I woke at certain times and ate at certain times and planned everything around numbers on clocks and calendars. Living in the moment was a dream on a shelf. Then I took up poker full-time and I became cathemeral and some years went by. Without effort, I gradually spent more and more time in the present. And I figured out why. My old lifestyle had hours and days and weeks coming and going all over the place. My new lifestyle didn't. It was the constant tracking of time that had distracted me from today, whatever day that is. World-class coach and author Tommy Angelo is now offering poker pain relief to everyone. You can schedule a call to talk to Tommy about bad betting, bad quitting, bad tempers, or whatever else is hurting your game. Just go to tommyangelo.com. 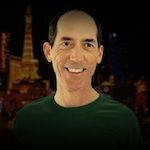 Angelo’s first book, Elements of Poker, was called "the seminal poker text of the 21st century" by The London Times, and it has revolutionized the way serious players approach the game. 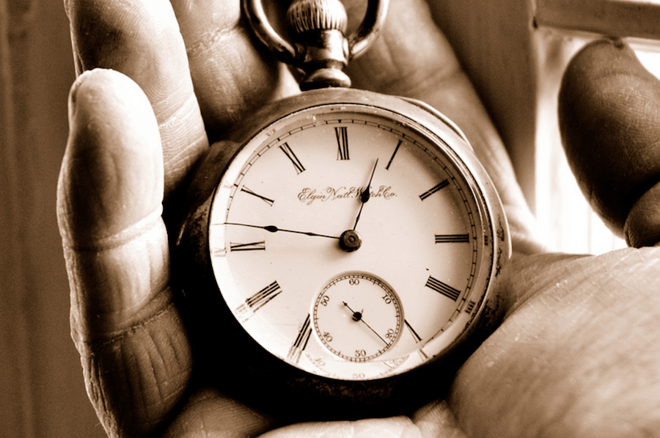 Photo: "Week 7 - Antique Pocket Watch" (adapted), Kim Carpenter, CC BY-2.0.